*Disclaimer: I received this wine as a sample from Bin Ends Wine in order to participate in the Wines of Argentina Twitter Taste Live. Perhaps this is a common blend in Argentina. I don’t really know. But it was a bit odd to me, especially given the common flavor profiles of the Bonarda and Syrah Grapes. 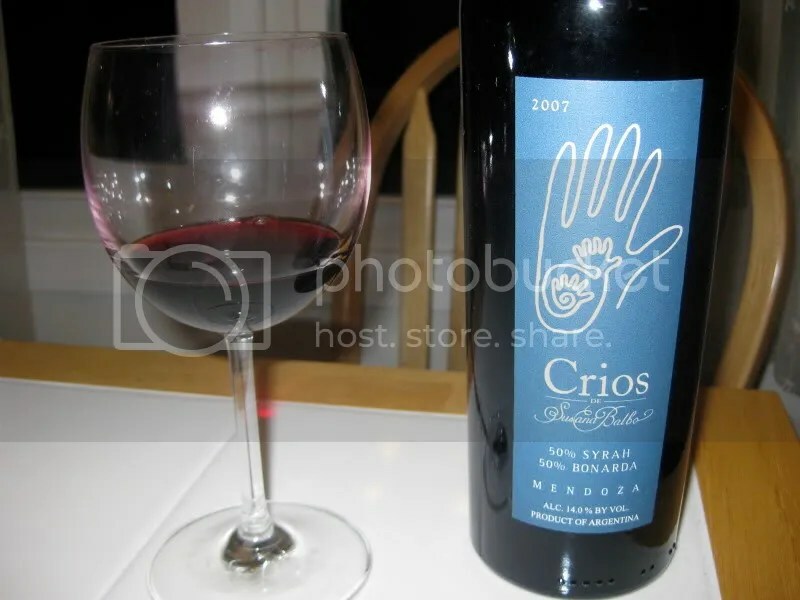 Up 2nd to last at the last Wines of Argentina Twitter Taste Live was the 2007 Crios Susana Balbo Syrah Bonarda. It’s a 50/50 blend of each grape. The wine had a screw cap closure, clocked in at 14% alcohol by volume, and retails for around $14. On the nose I found graphite, red berries, rare meat, then grilled meat, black cherry, black fruit, black plum, currants, red currants, a little earthy/leathery thing going on, and some spice. It was quite the nose and I think the Syrah most definitely dominated since my other two Bonarda experiences gave me some grapey and spicey notes and not much else. In the mouth I got bitter chocolate, bitter espresso, a little grapeyness, currants, black plums, dark fruit. 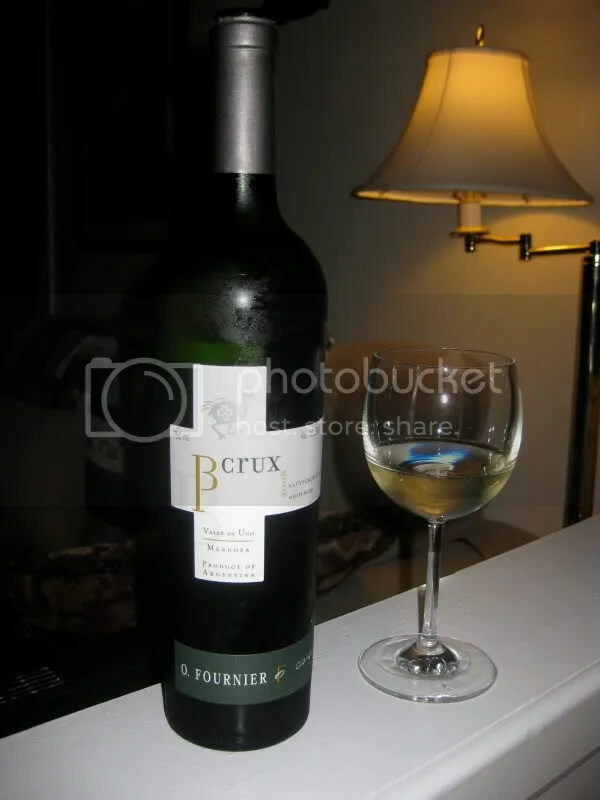 Overall I found the wine to b very dark and a little astringent. *Disclaimer: I received this wine as a sample from Bin Ends Wine so I could participate in the Wines of Argentina Twitter Taste Live. I think that this is the first wine from a 2009 vintage that I’ve had. Usually I don’t see the 2009s until maybe late spring of the following year. So to have one in September, well, I was surprised! Another wine from Argentina tasted in conjunction with the Wines of Argentina Twitter Taste Lives, I believe this is the last Torrontes of the bunch. 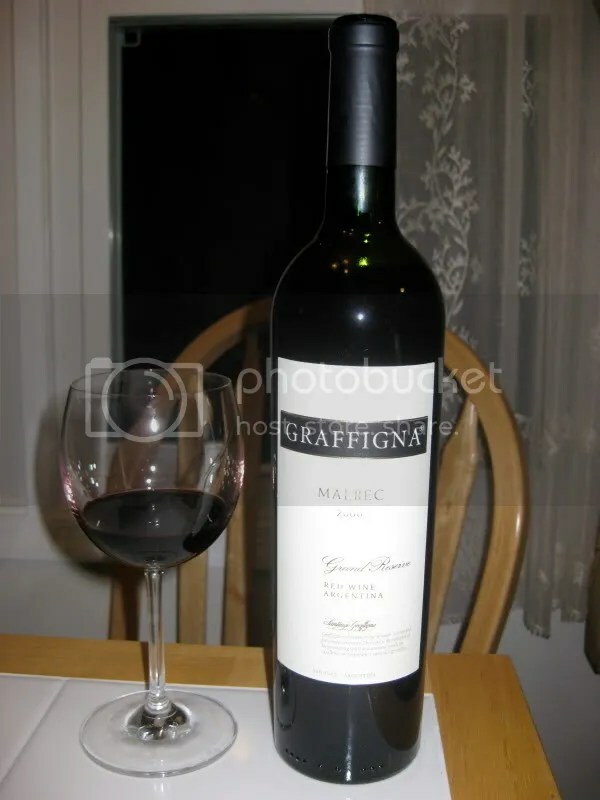 I have 2 more bottles of red wines to review and then it’s on to the Wines of Germany. 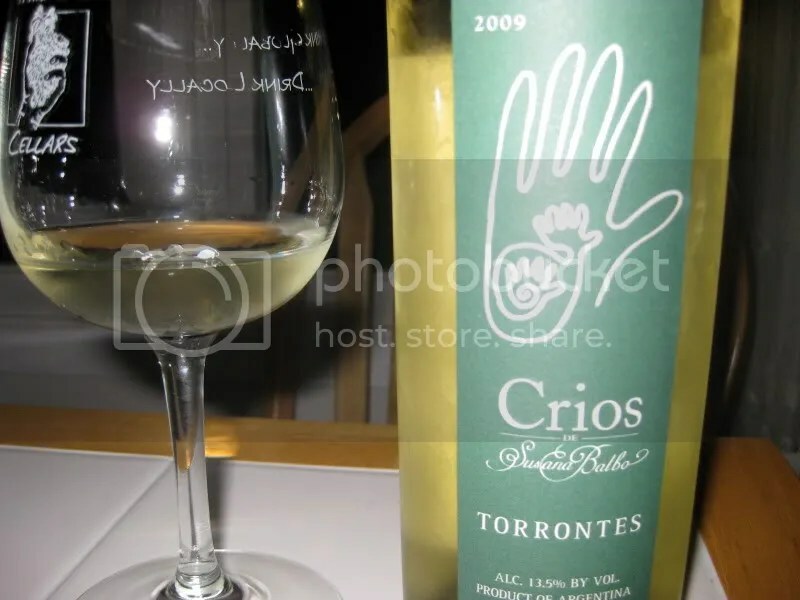 Last up for the whites, the 2009 Crios de Susana Blabo Torrontes. It had a screw cap closure, clocked in at 13.5% alcohol by volume, and retails for about $15. I sat up and said “Wow” when I opened this bottle. I could smell it as soon as I took the cap off. On the nose I found honey, white flowers, honeysuckle, slight vanilla cream, white pepper, spice, tropical fruits, and pineapples. I’d call the nose “spritzy.” In the mouth I got white peach, yellow apple, citrus, lemon, tropical notes, orange blossoms, and pear. The wine had an almost slightly oily finish though it was crisp and acidic through mid-palate. 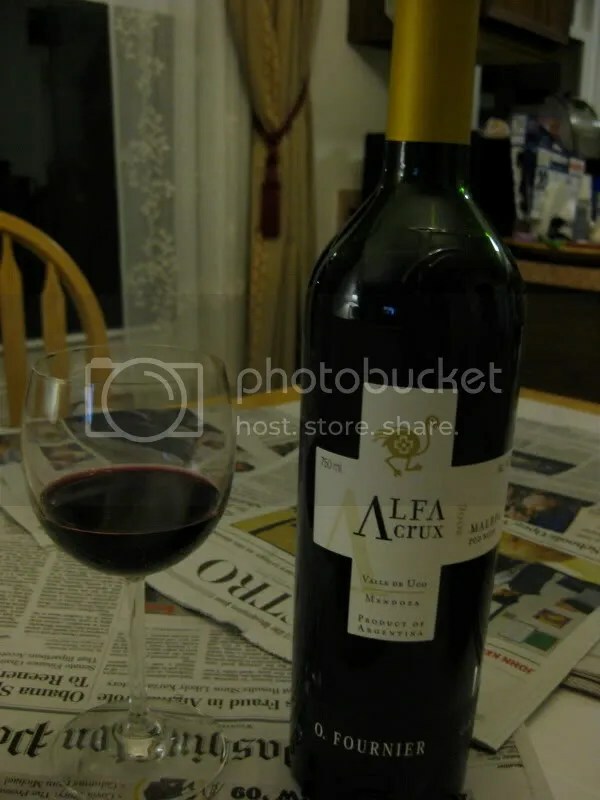 Filed under: Argentina, Bin Ends Wine, White, Wine |	Comments Off on First 2009? More Malbec! More Argentinian wines! They are like the Energizer Bunny around here, they keep coming and coming and coming. Never fear, some day soon (very soon) I will be taking a rest from Argentina and then I have some excellent Rieslings that I can’t wait to share with you and I will be off to Portugal in a mere 10 days! 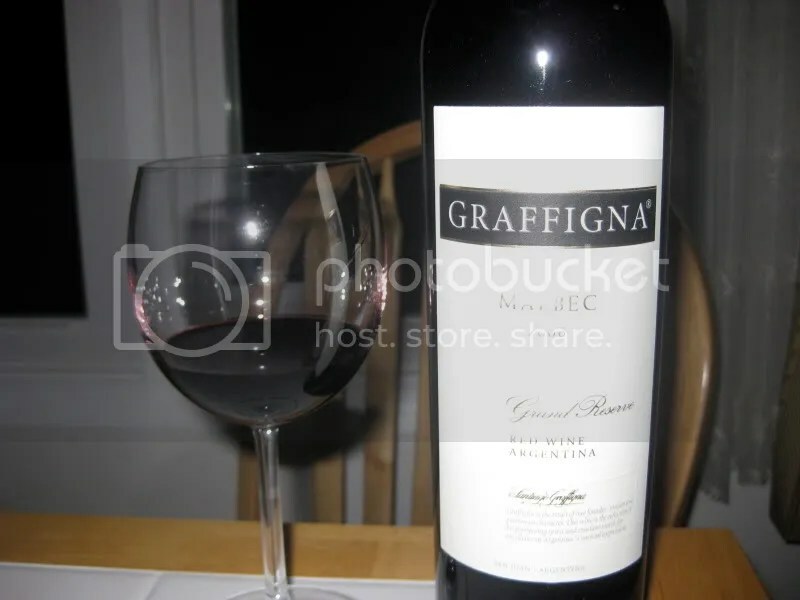 Today I’m telling you about the 2006 Graffigna Malbec Grand Reserve. 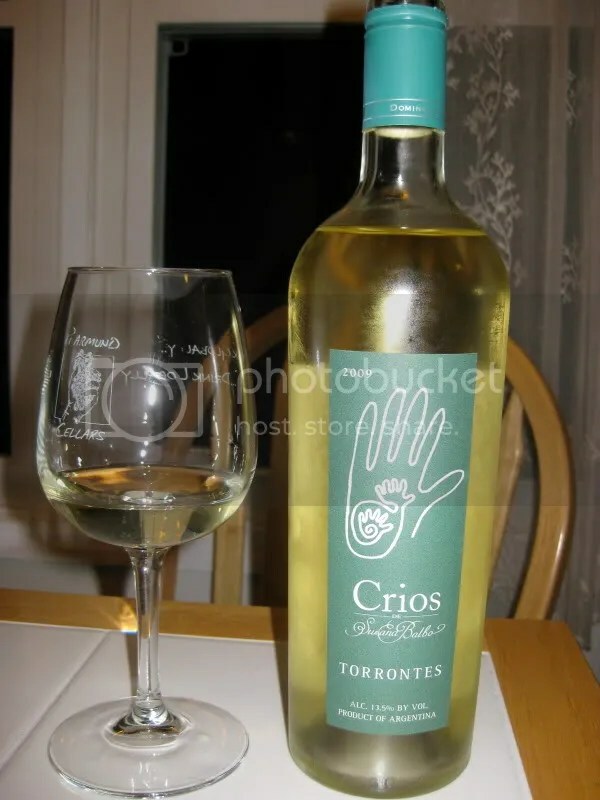 It had a real cork closure, clocked in at 14.5% alcohol by volume, and retails for around $20. On the nose I found pepper, spice, herbs, cumin, pencil lead, black plum, black fruit, grilled meat, slight black cherry, an entire spice and herb rack, and bubblegum. Think a giant pink wad of BubbleYum. (Is that even made anymore?) In the mouth I got cherry, blackberries, plums, all of which seemed extremely tart, spice, and a little earth. The palate showed almost entirely tart fruit and seemed quite tight. 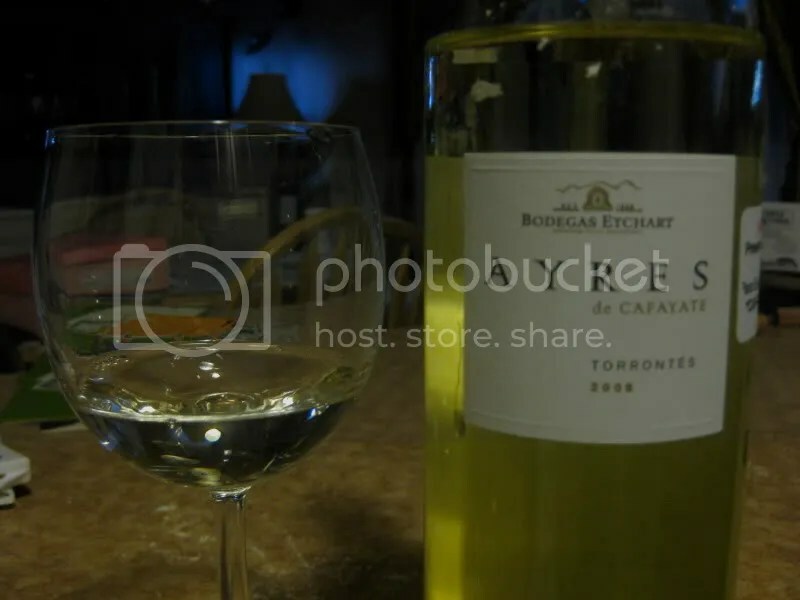 *Disclaimer; I received this wine as a sample from Bin Ends Wine in order to participate in a Twitter Taste Live. I think after this bottle I still have 5 more Argentinian wines to tell you about from the Wines of Argentina Twitter Taste Live series. 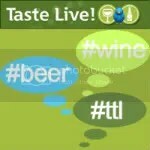 I participated in every Argentina Twitter Taste Live so I got to taste through quite a range of wines! And since we are only two people, we weren’t really opening up any other bottles during that time as we couldn’t drink them fast enough! 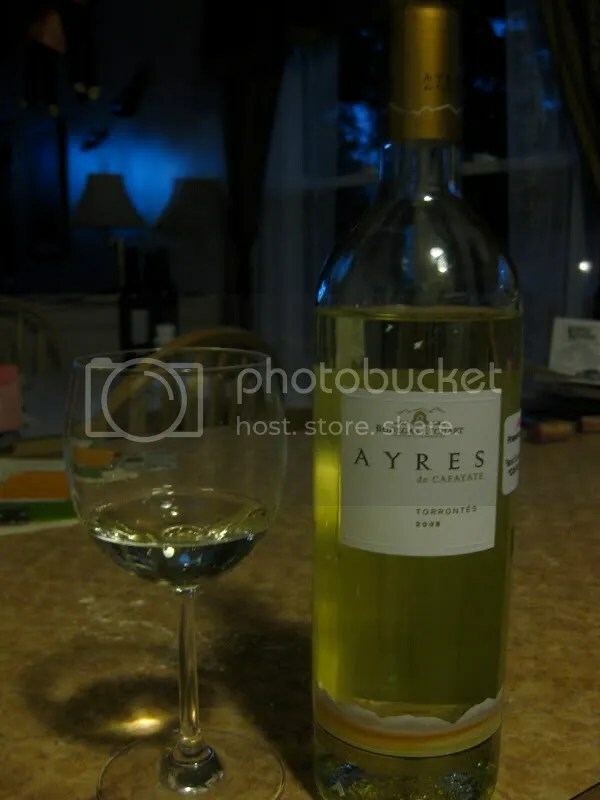 One of my favorite Torrontes was this 2008 Bodegas Etchart Ayres Torrontes Reserve. It had a real cork closure, clocked in at 14% alcohol by volume, and I have no idea what it retails for. My first note for this bottles says: Wow, what a nose! The nose on the wine was great. It had florals, perfume, orange blossom, jasmine, honeysuckle, white pepper, white flowers, pear, tropical fruit, citrus, grapefruit, and something sweet lurking on the nose that I almost want to call marshmallow. In the mouth I got citrus, grapefruit, meyer lemon, florals, tangerines, clementines, soft pear, tropical notes lurking behind, and an overall delicate citrus sensation. 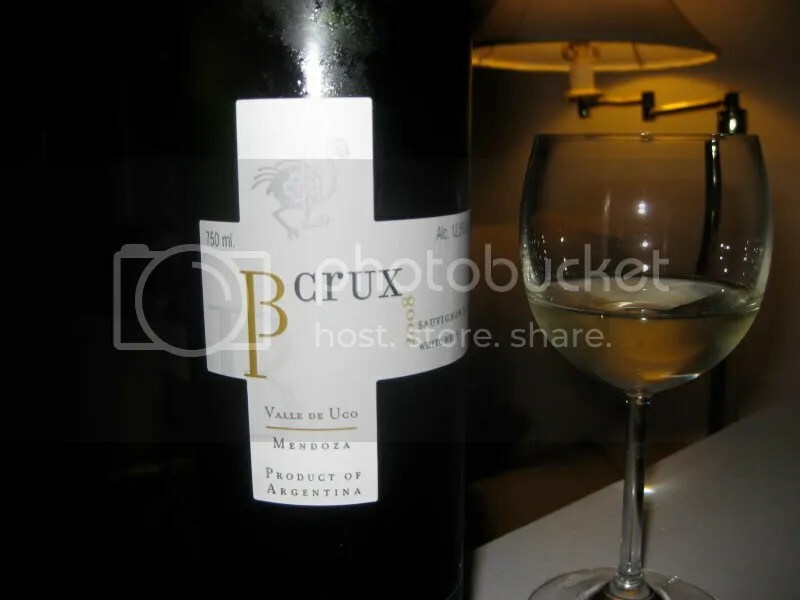 The wine had racy acidity and we really enjoyed it. Lots and lots and lots of Malbec. Malbec everywhere! I suppose it is one of Argentina’s signature grapes, so it makes sense as to why we tasted so many over the course of the Wines of Argentina Twitter Taste Lives. More Malbec than I’ve ever tasted though! 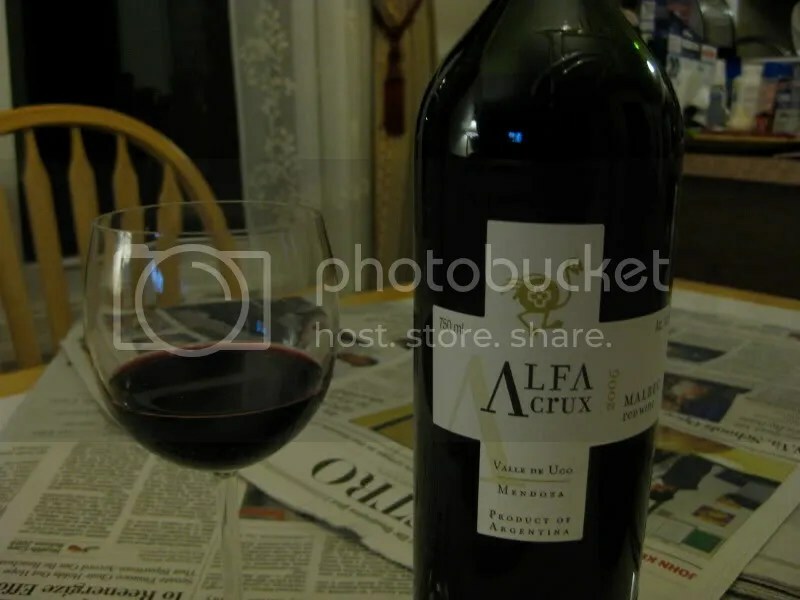 On the 3rd night of the TTL series, we tried the 2006 Alfa Crux O. Fournier Malbec. 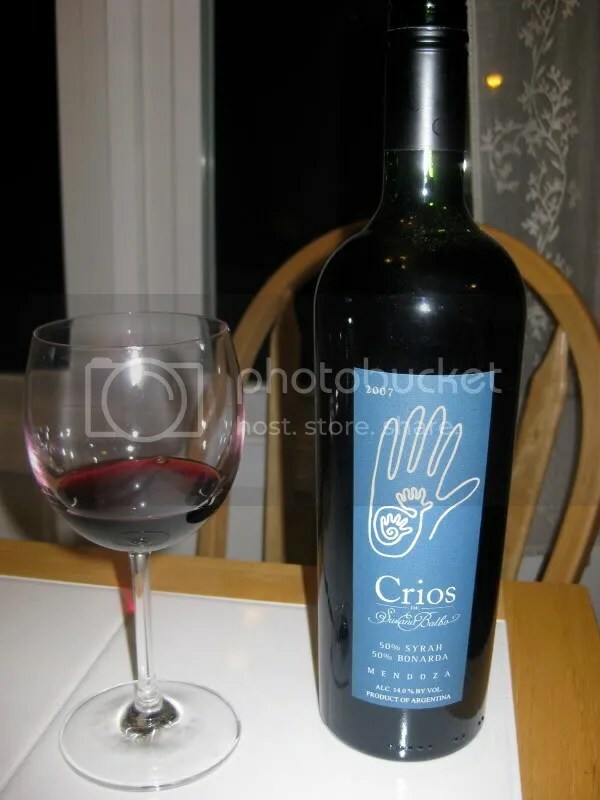 It had a real cork closure, clocked in at 14.5% alcohol by volume, and retails for around $37. On the nose of the Alfa Crux I found blackberry, blueberry, plum, black cherry, spice, cinnamon, and smoke. My notes say “I want to go swimming in this juicy black fruit.” (Wondering how late into the evening I was typing up those notes….!) In the mouth I got the same black fruits as the nose, some essence of a blueberry/blackberry pie/crumble, spice, and a little earth. Overall, I really liked this one, especially the nose. Grape 100!!! We made it to the Century Club! Now I just need to print out my application form and submit it and in about 6 weeks we’ll get nifty certificates memorializing out membership! Now, I tried to get a few of these grapes towards the end, but most we just tasted organically along the two years or so I’ve been tracking what we drank. I believe that every grape we have consumed is documented on the blog, though it wasn’t until the 70s that I started noting it here on the wine blog. Next, we shoot for the 200 grape mark! I’ve already got a few new grapes kicking around that we haven’t tried yet 🙂 Anyway, the wine! 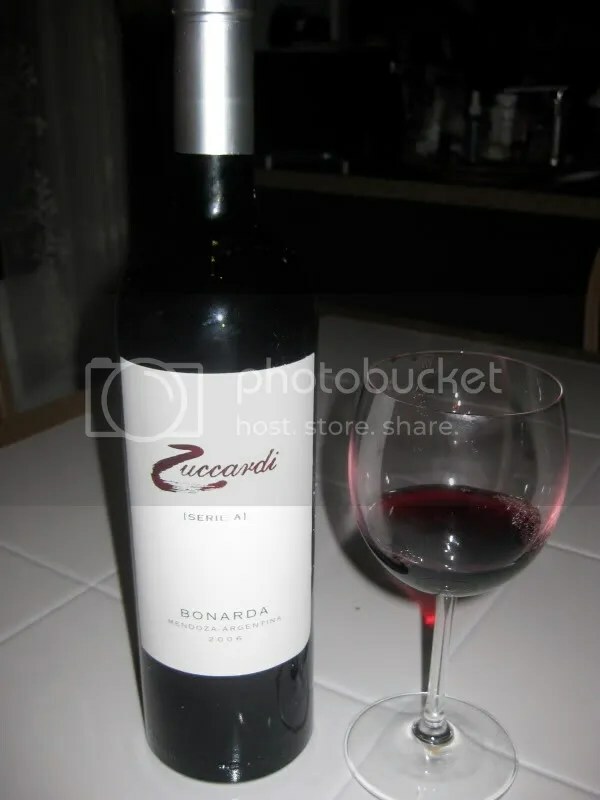 One of the grapes we tasted a few times for the Wines of Argentina Twitter Taste Lives was Bonarda. I gather there’s some recent argument over whether Bonarda is genetically the same to Charbono, but it’s listed separately on the Century Club application and there appears to be no definitive word on the matter yet. 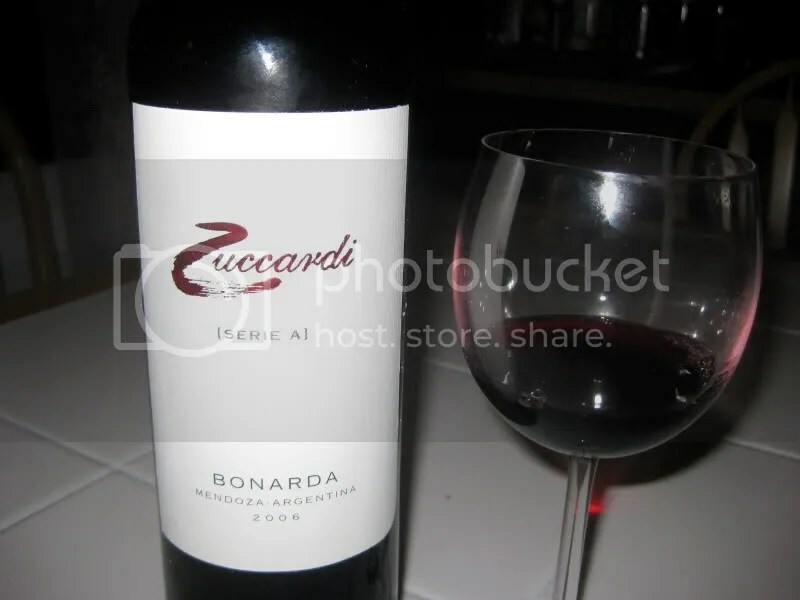 We tried the 2006 Zuccardi Bonarda at the 3rd Argentinian Twitter Taste Live. It had a real cork closure, clocked in 13% alcohol by volume, and retails for around $14. On the nose I got blackberry jelly, a little smoke, spice, herbs, strawberry candy, black currant, and grape jelly. The nose seemed fairly sweet to me. In the mouth this tasted a lot like spicy grape juice. I found it to be a pretty simple overall and it reminded me somewhat of Norton, especially given the grape juice and grape jelly characteristics.